The Great Fire of London started accidentally in a bakery, right? That wasn't the view at the time - many believed it was a terrorist attack and violent reprisals against possible suspects soon followed. The date 1666 is one burned on to the collective memory of a nation. Everyone learns at school that the fire raging for four days in that hot, dry summer began in a bakery in Pudding Lane. But a new Channel 4 documentary focuses on the lesser known story of the fire - it sparked a violent backlash against London's immigrant population, prompted by the widely-held belief at the time that it was an act of arson committed by a foreign power. In the days and weeks following the fire, ordinary Londoners - many of whom were displaced and homeless - gave evidence to a parliamentary inquiry swiftly launched to find out what happened. All those witness statements can be found in the inquiry's report, a 50-page document held in the capital's Guildhall. It suggests the city on the eve of the fire was one fraught with anxiety and paranoia, says Sue Horth, the documentary's executive producer, and the finger of blame was pointed at two countries with which England was at war, Netherlands and France. "We teach people about Pudding Lane and the hot summer but we don't say that weeks before the Great Fire, the British Navy sailed into the city of West Terschelling in the Netherlands and set fire to it in an act of diplomatic piracy. "London was expecting an act of reprisal against the city. It was expecting something bad to happen, not because it was superstitious or frightened, but because the government had done something bad. So when the fire happened, it was a natural and quite sensible suspicion for the people of London to have." As the fire raged, and rumours spread that the French had invaded, angry mobs hunted anyone who appeared to be foreign, says Ms Horth. A Swedish diplomat was lynched. A French woman trying to escape to a refugee camp in Spitalfields had her breast cut off because people thought the baby chicks she carried in her apron were fireballs. "London was a city turned to constant night, with the ash cloud and smoke, and the sun couldn't penetrate, so it was a frightening place to be. Thousands of buildings were razed. People either tried to escape or they fought the fire or they tried to find those responsible." 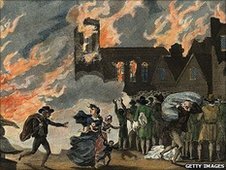 This violence is the untold story of the fire, says Adrian Tinniswood, author of By Permission of Heaven: The True Story of the Great Fire of London. Most people thought it was an attack by the Dutch, because of the recent atrocity by the Royal Navy under Admiral Robert Holmes. "There was cheering in the streets of London when that happened, so when the fire started, people thought it was the Dutch getting their own back. "In fact, the fire was caused by a gale blowing across London for four days. It hit London in the early hours of Sunday morning, just as [Thomas] Farriner's bakery goes up in flames. The gale blew embers and bits of straw across the city and fires broke out all over the place, so people said: 'This isn't a fire spreading, it has to be arson'." On the fourth day, when the fire was finally quelled, King Charles II, the newly restored monarch after years of civil war, tried to calm matters by going to a new camp of 100,000 homeless, and declaring the fire was an act of God. The king took a very enlightened view and always believed it was an accident, says Mr Tinniswood. His brother, James, Duke of York, went even further. He rode into the city with his bodyguards and rescued people from the mob, some of whom were in the very act of being hanged on street corners. The hunt for a foreign scapegoat continued, until one volunteered for the role. At the end of September, the parliamentary committee was appointed to investigate the fire, and a French Protestant watchmaker, Robert Hubert, confessed to having deliberately started the fire at the bakery with 23 conspirators. Although his confession seemed to change and flounder under scrutiny, he was tried and hanged. Afterwards, colleagues told the inquiry Hubert had been at sea with them at the time, and the inquiry concluded the fire had indeed been an accident. No-one knows why he confessed. Until the 19th Century, the plaque at London's Monument stated that followers of the Pope were to blame, says Ms Horth, and named Hubert as the fire-starter. It was only after Catholic emancipation in the 19th Century that the government decided the plaque was inflammatory and had those inscriptions removed. "This story [about it being an accident] is not necessarily the most helpful for us all to believe," Ms Horth says. "The truth is that we will never know how it began. We now believe it was an accident but 350 years ago certain people thought differently. There are many perspectives to events and it's up to us to understand them all." It's natural the version of events told to youngsters should airbrush the gruesome details, says Meriel Jeater, curator at the Museum of London. "The traditional view taught in schools is that it all happened as a happily-ever-after sort of story. 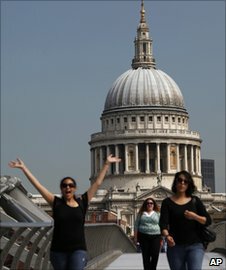 It was a terrible disaster, but not many people died, we rebuilt the city in brick so it was fireproof, and isn't St Paul's pretty? "But the more you investigate, you realise it wasn't all like that. The dark side was that the fire burst on to the surface religious tension and paranoia about national security." It's a tale with echoes today, says Ms Jeater. "When I was curating the exhibition, it wasn't long after the 7/7 bombings and when I was reading about the reactions against Catholics and the Dutch, it struck me that there were a lot of similarities with the backlash against Muslim people after the bombing. A lot of suspicion about people living in London. "It's different people and different events, but I think human nature is very similar." The Untold Great Fire of London is on Channel 4 on Wednesday, 30 June at 2000 BST. I just did a dissertation on the Fire, I was looking at the rebuilding mostly. I also wrote an essay on minorities in London during this period. I considered looking at the Catholics as a minority population too. There is a lot of evidence to suggest that Catholics were blamed for the Fire, not least the Monument had an inscription calling the fire a "popish plot", and King Charles II made declarations to this effect too. It should be noted however that the paranoia against Roman Catholics at the time was not entirely unjustified. 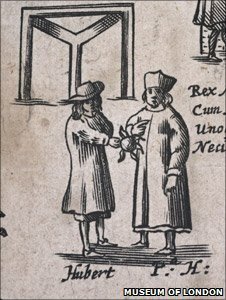 It had only been in 1605 that there had been a plot by Roman Catholics to blow up Parliament (the famous Gunpowder Plots in which Guy Fawkes was heavily implicated) A number of other attempts had also been made. The fact that the country was also at war in 1666 would have added to the paranoia against foreigners in general and Catholics in particular. Does this mean that the airing of these views in the documentary might encourage a more honest teaching, in schools, of the events? Or will it be more evidence of history being what its writers say it is? Perhaps all we've done all these years is to look at bakers' boys with more suspicion ...!? Very interesting! It puts some of the anti-Muslim propaganda I regularly come across in perspective. "It's different people and different events, but I think human nature is very similar." Sadly, so very true. In 344 years we have learned nothing. Ms Jeater compares it to the 7 July 7 bombings, but in that case it really was a conspiracy by a religious minority to cause harm to London. Don't compare it to 1666, which was an accident.